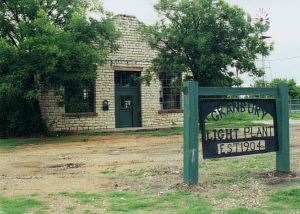 Before 1923, privately owned light companies supplied electricity to the citizens of Granbury. In that year, the residents voted to build and own their own power plant. The city purchased the Granbury Water, Ice, Light and Power Co. and built this structure to house the new plant. Constructed by the Municipal Engineering Company, the industrial building still houses the diesel engines and other machinery that generated electricity until the plant closed in 1954.